Does Obama have an approval floor? On Dec. 3, 2013, President Obama hit his low point in approval as president, at least according to RealClearPolitics' aggregate average of approval polling 1. That day, Obama fell below 40% for the first time in RCP's measure, sinking to 39.8%, though he has since rebounded slightly to 42.1%. Two days after Obama dropped under 40%, Gallup released a report 2 on the president's approval that showed how his support among different demographic groups had fallen over the past year, in some cases a great deal, with a particular focus on the decrease in approval among Hispanics. Needless to say, we can't predict what will happen with Obama's approval from here. Is the worst over for him? Will he dramatically fall off or bounce back up? That said, it's tempting to suggest that Obama might have an approval “floor” -- basically, because of his strong support among nonwhites, he might not fall much below 40%. But is that true? Again, it's impossible to say what events could impact the president's approval, for better or for worse. But there's little reason to think that Obama has a “floor” in approval that he can't dip below. That evidence comes in part from his predecessor: President George W. Bush. To be clear: We're not comparing Obama to Bush because we necessarily think that the current president will suffer the same approval decline as his predecessor. Bush's approval dwindled over the last few years of his presidency, finishing at just 29% in RealClearPolitics' aggregate average 3. Rather, we're comparing the two because both won elections due, in large part, to fervent support from similarly-sized but different core sets of supporters. For Obama, that core was nonwhites. For Bush, it was white evangelical Christians. Comparing the two presidents' approval ratings with these key groups suggests that it is tenuous to claim that Obama has a higher approval floor because of his stronger support among nonwhites. In American politics, there are two large demographic groups with sharply different political leanings whose members do not overlap: white evangelicals and nonwhites. Combined, these two groups of roughly equal size made up more than half of all the voters in 2012: According to exit polls, 26% of voters were white evangelicals and 28% were nonwhite. The two groups have almost exactly opposite voting habits: In 2012, about four of five nonwhites backed Obama, while about four of five white evangelicals backed Mitt Romney. In 2004, Bush won 78% of white evangelicals -- the same percentage who backed Romney in 2012. Given that there's no crossover among these groups -- nonwhites can be evangelical Christians, but they cannot be white evangelicals -- and that they are political opposites of roughly the same size, it seems reasonable to compare how white evangelicals viewed the president they heavily supported, Bush, to how nonwhites view the president they strongly backed, Obama. What we found was that these groups support their president at a much higher rate than Americans as a whole, but when either president dipped with the general public, he also dipped in a similar way with white evangelicals (in the case of Bush) and nonwhites (in the case of Obama). Unsurprisingly, George W. Bush's approval among white evangelicals remained far higher than his overall approval, even as things went south for his administration due to troubles in Iraq and the onset of the Great Recession. Looking back at ABC/Washington Post polls from Bush's second term, we can see the changes in his approval in Chart 1 below. Notice that Bush's approval in the first part of his sixth year was largely similar to where Obama's is today, and his approval among white evangelicals in the ABC/Washington Post poll was nearly as high (61%-62%) as Obama's approval among nonwhites in the Gallup poll's December average (65%). The white evangelicals who formed the bedrock of support for Bush in his two successful presidential elections were a much better demographic for him than all American adults -- he performed an average of 20.4 points better among white evangelicals throughout his second term. But as overall approval of his performance decreased, support for Bush eroded among white evangelicals, too. Bush started out at a higher point with white evangelicals, but his support within this group fell more or less in equal measure with his overall approval. This was, in other words, a largely uniform swing. Obama's numbers with nonwhites have moved in much the same way. By simply looking at exit polls from the 2008 and 2012 presidential elections, it's clear that Obama has counted on nonwhite voters as a major base of support. As every 2012 election postmortem highlighted, Mitt Romney won 59% of the white vote in 2012, something last done by George H.W. Bush in 1988 (who won 60%). But unlike the elder Bush, who won the popular vote by over seven million votes, Romney lost it by nearly five million. Clearly America is changing, and Obama put together a winning coalition incorporating much of that change, racking up huge margins among nonwhite voters. In Chart 2 below, we see Obama's overall approval and approval among nonwhites in the weekly Gallup averages since the start of his tenure. For the most part, Obama's approval among nonwhites moved in much the same direction as his overall approval and in similar magnitude. The margin between Obama's approval among nonwhites and all adults, on average, has differed by 22.4 points. This gap is very similar to Bush's approval difference between white evangelicals and all adults. In other words, what we're seeing here, too, is a relatively uniform swing. While Obama's approval is naturally going to be higher with nonwhites than with the American public as a whole -- just like Bush was with white evangelicals -- the same forces that drive down his overall approval affect his standing with nonwhites in similar ways. 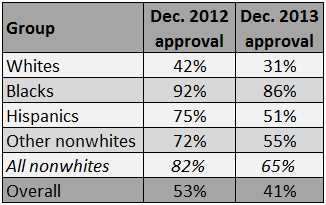 Obama's approval in Gallup's poll was 41% at the end of December 2013 4, and his approval among nonwhites sat at 65%. If Obama's approval among nonwhites moves in a comparable fashion to Bush's approval among white Evangelicals, his approval is capable of going significantly lower than it is now. 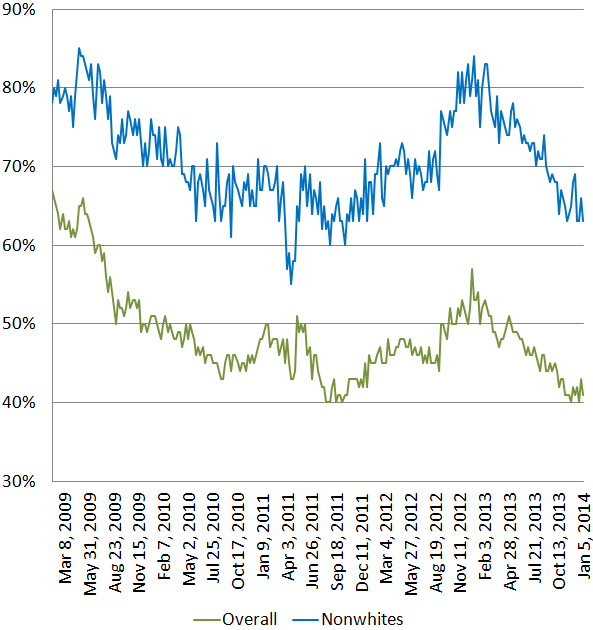 Bush's approval fell into the low 30s even before the economic crisis hit. 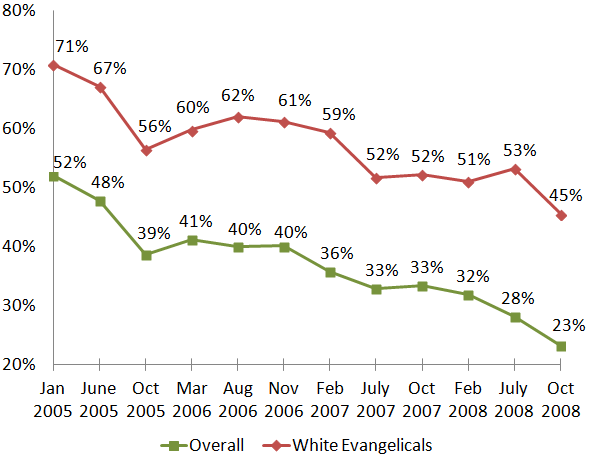 Once it struck, even Bush's approval among white evangelicals went underwater. Again, white evangelical support for Bush was, on average, about 20 points greater than support from the general public. Obama enjoys a roughly similar edge with nonwhite Americans. But that backing is not unconditional, and when both presidents saw their standings erode with the general public, that loss of support showed up even amongst these groups, which were generally much more supportive. If Obama truly has a floor in overall approval -- a number below which he couldn't fall -- we would need to see some indication, historical or present-day, that nonwhites have an intrinsic attachment to Obama that is more durable than evangelicals had for Bush. But we saw little evidence of that in the polling trends during the Bush and Obama presidencies. The Gallup analysis comparing Obama's December 2012 standing with his approval last month shows this generally uniform swing. See Table 1 below. Note: “Other nonwhites” percentages for December 2012 and 2013 estimated from available data. In a year, Obama dropped 11 percentage points with whites and 17 points with nonwhites. That's a 26% drop among whites, and a smaller but similar 21% drop with nonwhites. This is a simpler way of reiterating the point above: Obama will always do substantially better with nonwhites than he does with Americans as a whole, just like Bush did with evangelical whites. But if Obama actually had a floor, we would expect his nonwhite decline to be substantially less pronounced than his white fall. While Obama's drop-off has been less severe with nonwhites, the negative turn in his numbers is obvious among both whites and nonwhites. Naturally, how this projects to the future is anyone's guess -- again, we don't know where Obama's approval will go over the remainder of his term. But Bush's experience suggests, as does Obama's so far, that the approval from his top supporters will rise and fall in a similar way with the rest of the country.